The team at Perth Fibreglass Pools can transform your tired concrete pool in to a vibrant, easy to maintain fibreglass pool by preparing and bonding a new fibreglass shell to your existing concrete pool. Sound simple? That’s because it is. Let’s take a look at the process so you know exactly what to expect when it comes time to convert your pool. Unlike a fibreglass pool shell that can move when emptied, a concrete pool is a solid structure that does not require bracing. The pool water is emptied through our high powered pumps. We have over 100m of pipework so big blocks and long driveways are no problem. We also have specialist pumps for dirty water pools. Typically a 40’000ltr pool can be emptied in 2.5hrs. Perth Fibreglass Pools has developed a unique locking system that ensures the new fibreglass layer remains bonded to the existing concrete shell for the duration of the pools life. We prepare the tiles and around jets, skimmer boxes, pool lights, steps and the top circumference of the pool. The vinyl ester putty that we apply in to our strategically placed cuts/grooves ensure that you will never have to change the fibreglass layer again. A layer of fibreglass is applied to the entire pool. This layer adds strength to your pool and acts as a solid protective barrier from future osmosis and black spot. Perth Fibreglass Pools uses a base layer of vinyl ester resin, followed by 300gsm fibreglass matting and and another layer of vinyl ester resin. Applied with 180mm rollers, the resins consolidate through the matting and bond to the original shell. Double layers can be applied in weak areas of your pool for extra strength. Before the top coat is applied, the team scrutineer their work, looking for imperfections or defects. We repair and smooth out anything we feel necessary to achieve a great finish. At this stage we apply our unique non skid system to the steps and edge beams. The outer edges of the non skid are taped to give prominent lines, thus producing a great, professional finish to the pool. Tarps are erected over the pool during renovation. 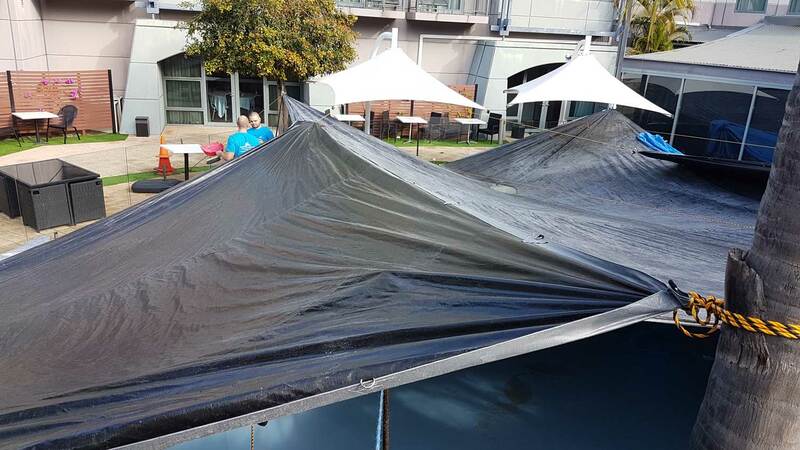 The tarps keep us protected from the weather and limits the amount of dust/debris escaping from the work site. UV rays from the sun can effect curing times and the finishing top coat is 100% UV free. The rest of the concrete/render surface is now ground back to acheive a good key for the new layer. All hollow patches in the render, cracks and broken tile work is repaired and also sanded back. This resin is perfect for concrete pools and will soak in to to the concrete/plaster work making sure that the new fibreglass layer will not delamintae. It is vital that the resin used at this stage is of good quality. The cured fibreglass layer will be lightly sanded to eliminate sharp edges. A layer of FIBRETECH vinyl ester fill coat is applied with rollers to the entire pool. The fill coat layer will fill any small gaps between the fibreglass matting. It also acts as a great chemical barrier and an important primer ready for top coat. The fill coat is left to cure and then sanded back to give good key. The final layer applied to the pool is the Aquaguard coloured top coat. The top coat is applied with 180mm high quality rollers and brushes. We take great care to ensure the top coat is correctly applied. We measure the ambient temperature, moisture levels, and heat spots within the pool. We match this information with correct levels of catalyst in our mixtures and also use this information to determine the size of each mix. Generally a 1% – 2% catalyst to top coat ratio is used. We allow the top coat to cure naturally to ensure the wax rises to the surface before we remove our tarps. The team will give a final inspection of the pool and remove the tarps. We clean the area and take away all rubbish. Leaving you with a vibrant new pool surface that will rejuvenate your outdoor area for many years to come.